Hillary Clinton's press spokesman Nick Merrill responded in a Twitter message to an NBC News report about the Democratic presidential nominee's ill health by tweeting, "this ain’t news . . . Get a life." A spate of coughing fits by Clinton has resulted in a re-examination of the health issues that have been dogging her ever since a concussion resulting from a fall in December 2012. Although the press has been under steady fire from the Clinton campaign over Mrs. Clinton's repeated coughing seizures, as well as repeated bed rest, such attacks over presidential health issues are not new in American history. In 1955, when President Dwight Eisenhower suffered a major heart attack, the president briefly considered not running for a second term in 1956. There was an attempt by the Eisenhower administration to keep the seriousness of the heart attack from the press. Neither Eisenhower nor his closest aides wanted to give Vice President Richard Nixon and his supporters reasons to demand Eisenhower step down for health reasons in favor of his scandal-plagued vice president. First Lady Nancy Reagan and her closest aides fended off questions from the press about President Ronald Reagan's early stages of Alzheimer's disease during his second term. Mrs. Reagan, while not as hands-on in filling in for her husband as was Galt Wilson, was, nevertheless, involved in a number of important presidential decisions. The most infamous White House attacks on the press over presidential health came during the second term of President Woodrow Wilson. 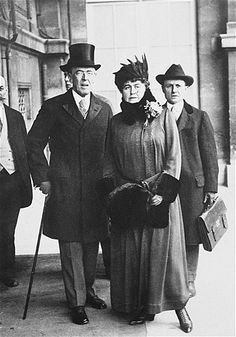 First Lady Edith Galt Wilson claimed that her husband's disappearance from public view in 1919 was due to "nervous exhaustion" from his participation in the Paris Peace Conference in Versailles, outside of Paris. In fact, Wilson had suffered a second stroke -- his first was in 1914 -- that left him permanently paralyzed on his left side. Efforts by most of the press to get to the bottom of Wilson's health issues proved unsuccessful for all of 1919 and early into 1920. The New York Times, always prepared to carry the White House's political baggage then and now, wrote that the fact that Wilson managed to speak to Republican Senator Albert Fall during a visit to the White House, a call designed to ascertain Wilson's health, "silenced for good the many wild and often unfriendly rumors of Presidential disability." The term "unfriendly rumors" was the "conspiracy theories" pejorative of the day. In fact, Wilson was unable to walk, speak, or write and he tired easily and his attention span was limited. Wilson suffered from frequent headaches and double vision. Wilson's handshake was described at the time as feeling like "a ten-cent pickled mackerel in brown paper." The First Lady acted in the president's stead in an effort to prevent Vice President Thomas Marshall from assuming the presidency. Marshall was considered too close to Wilson's chief Republican adversary, Senator Henry Cabot Lodge. Conspiring with chief White House physician Dr. Cary T. Grayson, Mrs. Galt Wilson hid the president's massive stroke from not only the American public and the press but even from the president's chief aide, Joseph Tumulty. 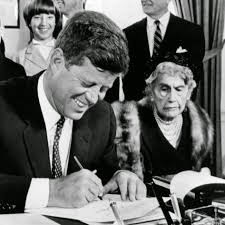 Edith Galt Wilson [right] with President John F. Kennedy in the White House in 1961. She died at the age of 89 on the morning of December 28, 1961, as she was preparing to attend the formal opening ceremony for the cross-Potomac Woodrow Wilson bridge, spanning the river between Alexandria, Virginia and Washington, DC. What does Wilson and Galt Wilson have to do with Hillary Clinton? Plenty. If a President Hillary Clinton's health were to decline, it is a certainty that former President Bill Clinton would emulate Galt and act in his wife's stead as president. Senator Tim Kaine was chosen as Mrs. Clinton's running mate because he, as was Marshall, is a milquetoast politician, would not seek to become acting president of the United States in the event of the incapacitation of the president. Marshall was urged to demand to be sworn in as acting president by Secretary of State Robert Lansing and other Cabinet secretaries but the former governor of Indiana, known as a go-along, get-along humorist who is best remembered for his quip, "What this country needs is a really good five-cent cigar," refused. For Bill Clinton, serving as the de facto president would be an effective third term as president, something barred by the U.S. Constitution. Substitute Dr. Oladotun Okunola, Mrs. Clinton's traveling neurologist, who is never far from her side, for Wilson's Dr. Grayson, and we have a similar situation of a doctor engaged in a medical cover-up. Photographic evidence showing Okunola constantly at the side of Mrs. Clinton, even helping her to climb stairs and remain steady while speaking, indicate that the Democratic presidential nominee is partially-incapacitated.